Investors are leaving trade tensions behind and looking ahead to bank profits. The Dow climbed 294 points on Thursday after Republican senators reported that President Trump may be interested in rejoining the Trans-Pacific Partnership trade agreement. It was one more small sign that trade fears may be overblown. Just last week, the Dow plunged on fears of a trade war between the United States and China. But trade tensions “seem to have dissipated a bit,” said Sam Stovall, chief investment strategist at CFRA Research. Chinese President Xi Jinping’s announced this week that his government would “significantly lower” tariffs on vehicle imports this year. Stovall said that helped calm investors, as did Trump’s walking back threats of an immediate strike on Syria. 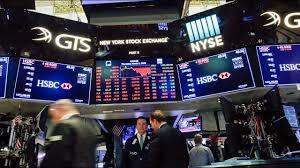 Bank stocks soared on optimism that their quarterly earnings, which start rolling in Friday, will be strong. Citigroup (C), Bank of America (BAC) and Goldman Sachs (GS) rallied nearly 3% apiece. Investors are looking forward to focusing on the fundamentals of corporate profits. Wall Street is predicting that earnings for the S&P 500 will rise 17% from a year ago, and banks are expected to do even better. Stovall added that Congress’ relatively light questioning of Facebook (FB) CEO Mark Zuckerberg quelled fears that technology companies could face strict regulations — helping left tech stocks that were flailing last week.